Councillors, I am here to present my petition Save North Kensington Library for Public Use. We have had many discussions as a group about what I would say when I came here today. The first version that I wrote of this speech was full of our willingness to work together with you on all the issues at stake in this particular move. We appealed to your consciences, we appealed to your sense of vision, we appealed to your Conservative values. But everybody here knows that no matter how carefully our arguments are parsed, you have already taken a decision on this matter. That decision has been taken by a few people in the majority party, and the whip has informed the rest of you how you will vote. Whatever I say to you now, this is a foregone conclusion that doesn’t represent the interests of the people of the community and in fact is about a few Councillors doing a few favours for people they know. The case of the library is the latest in what Cllr Nick Paget-Brown has smugly described as a hard-nosed approach to property management, but to everyone else looks like the loss of yet another community venue. This is blatantly an attack on working class people: this building was built by public donation for advancement of working class education. Handing it over to a prep school with fees of over £6000 a term is an absolute insult to the people of the area. It is hard to imagine a more offensive way to manage this building. Also hugely insulting in this case is the council’s derisory ‘consultation’ process. Choosing where the toilets go in the new building is not genuine public engagement and you know it. The architect’s proposals for the new building are an absolute embarrassment. They describe taking the account of the surrounding area by leaving a similar gap between buildings and building to a similar height. That’s it. The increased floor space they claim for the new building depends on ignoring the unutilised floor space of the current library. They report hoping that they can fit in as many books as the old library, but this is not guaranteed. The most used room of the current building, the computer room, will not be recreated in the new building. With serious and unanswered questions about how all the library users, including children, will share their space, and about integrated access for the youth club, but only a single lift to transport large groups of wheelchair users to the club, RBKC is setting up user groups for conflict. All no doubt convenient when you decide you want to close youth services all together. In the original speech I wrote we spent some time addressing your bad faith arguments about disabled access, an issue which is so unimportant to you, that you have contacted precisely no disabled peoples’ groups to discuss arrangements, at the old library or the new. I also responded to your sleight of hand about the old building’s listed status where you both argued that it made the library un-upgradeable and funded that same upgrade for the new tenant with concessionary rent rates. I politely questioned whether an £11-million-pound new building was really a fiscally sound response to such issues. But let’s be honest about what is really going on here. The decision to consolidate the library and the youth club onto one site is not because of a visionary new strategy in which we finally persuade disaffected youngsters to go into the library. Council officers pretending this is about anything but facilitating private interests insult everyone’s intelligence. This is about freeing up the old library for the neighbouring prep school, and building a new building whose top two floors will also be leased, to whom planners euphemistically describe as third party users. These third party users will be primary school children from schools who can afford to lease the space. To pretend that this means anyone but private schools is disingenuity that borders on fraud. Surprise, surprise, Cllr Fielding-Mellon’s children are on the list for the schools involved, a conflict of interest he wasn’t minded to announce when he proposed this strategy. The whole project is about the expansion of private schools into what are currently public spaces. These schools – Notting Hill Prep and Chepstow House – already treat people who can not afford their fees with contempt. Notting Hill Prep refuse to answer community requests to discuss their expansion plans, and Chepstow House will not even answer emails from the Youth Centre about the Centre possibly hiring their football pitch. So we are not expecting much from the supposed multi party use of the new sports facilities, the management of which planners are already dodging questions on. Go ahead and help these well-funded and elitist institutions if you must, but do it without giving them our library building. It’s not yours to give, it belongs to the community and you should have consulted us. We have plenty of ideas about how you might manage the building – this is the community whose creative interventions are responsible for example for Westway Trust, Westway Community Transport, the opening of Powis Square Gardens and so on. We have a history of transforming unimaginative and neglected private space into opportunities for the whole community. And since you are happy enough to slap compulsory purchase orders on council and social tenants – why not slap a few on those empty houses owned by off shore banks, and hand them over to the prep school? Councillors. You are happy to trade on the artsy, bohemian and creative reputation of this area. But while you happily congratulate yourselves on your house prices, you should stop to think about how much of that value is to do with the rich history of community partnership that you are turning your back on here. What a disappointment you are and what an embarrassment to democracy this whole process has been. 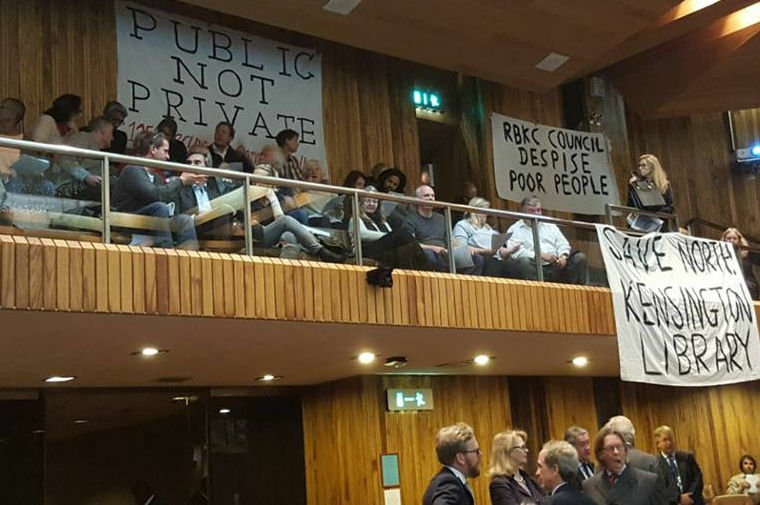 Written by Eve Wedderburn and read by Jacob Rety to a full council meeting on October 19th 2016 on behalf of Save North Kensington Library Building for Public use campaign group.